Posted July 30th, 2015 by doitoutdoors. We have a long, rambling list of reasons why we love mobile billboards, and especially our mobile billboards. But you’re looking for hard facts, the evidence that declares, without a doubt, why mobile billboards are an essential medium to any media plan. So we’ve scraped the hearts off of our sleeves to look very objectively at this advertising solution. Here’s a bit of science behind why mobile billboards work. Size really does matter. Bigger is better when it comes to advertising. When you’re trying to get noticed, a 10 feet high, 22 feet wide message will not be easily missed. Especially if it’s moving – and at eye level in the street. You don’t need a rocket scientist to tell you that you’ll be stacking the deck in your favor if you opt for a larger-than-life advertisement in a world full of clutter. Highly targeting your advertisement to the right people in the right place at the right time results in more quality impressions. 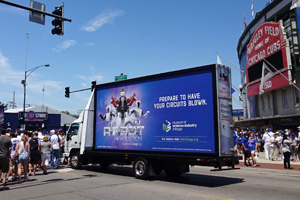 Because of the move-ability factor, mobile billboards can infiltrate a specific market, can narrow-cast down to a hyper-local level and can offer creative that speaks directly to your precise target audience. With intelligent mapping software, we can identify the most strategic route based not just on location but also demographics. Mobile billboards can also target based on interest. 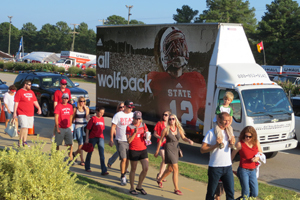 For example, if you want to reach sports fans, a mobile billboard can run during tailgating hours on busy game days. 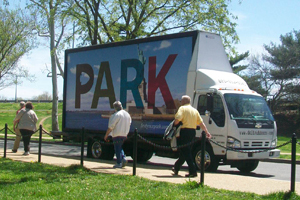 If you want to reach the college-aged crowd, a mobile billboard can target a campus and visit popular student hangouts. Large events, such as festivals, conferences, Comic-Con or the Superbowl are also great ways to target a specific type of audience. So not only will your reach and frequency rates be high, but you’ll be confident that those impressions were by the people you actually care about. It’s like Facebook advertisement segmentation, but real. Mobile billboards play nice with digital. According to NinthDecimal, pairing an out-of-home advertising campaign with a smartphone campaign can amplify the reach by up to 316%. With beacon technology, a mobile billboard can be noticed by all the right people in the right place at the right time, and it can now also send a contextually relevant, proximity-based message directly to someone’s smartphone via a brand’s own or a third party mobile app that aligns with the campaign’s target audience. Do we really need to go on? We admit that we are biased, but we believe that when you look at mobile billboards squarely, as impartial as a professional referee or as equitable as Judge Judy, you, too, will see that the advantages are just too stupendous to ignore. It’s love.